I woke up this morning and I checked my email and almost fell over. Ube sent me a link to 2 sets of pictures. 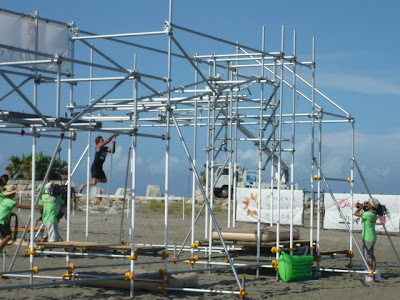 One was from MRT (the Miyazaki Prefecture Television Station (TBS affiliate) that broadcasted the Beach sports Miyazaki Prefecture Competition on July 26, 2008) and the other was a blog of someone who went. Staring at the pictures I've determined the the left side of the screen there is a trampoline.. you jump it.. grab the rope... make your way through the poles (sorta like devil steps? or is it jumping bars?) 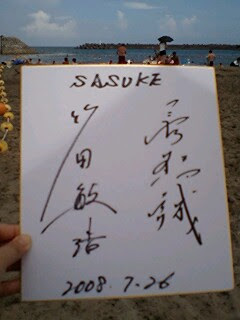 then on to some cliffhanger (you can see it better on Takeda's picture). 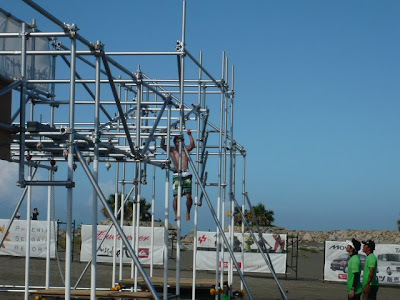 Judging by the position of the person taking the photos it seems that this is the second portion of the obstacle. 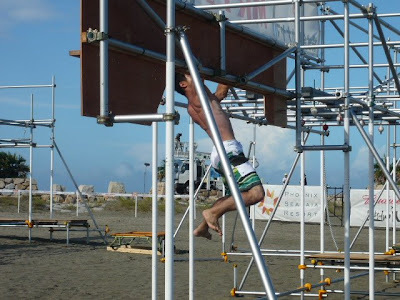 When I see Takeda's pictures below this you can see another set of obstacles. 10 final stage, but no one clear until the end. With two, he's the whole process both 51 seconds clear. 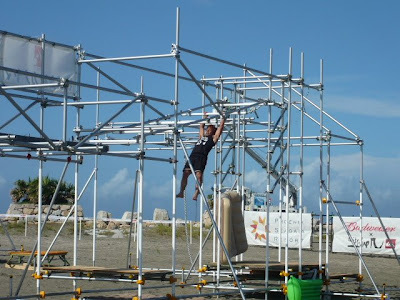 According to my previous blog and the rules for the final stage: Final - BEACH JUNNGLEGYM - TBS television is known for his "SASUKE" training machine is the venue! so far is only 10 fit men and women. So it seems Takeda and Nagano were the only 2 to clear and seem to have tied with 51 seconds each. Hey Anna :) didn't see your post there :) Missed ya as well! Nagano weating shorts! Mmm less chocolate before blogging next time...I guess i'm allucinating.But it is a nice one! 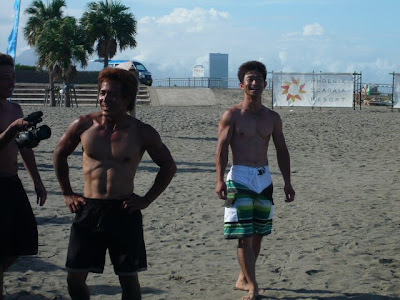 Really, Nagano is burned, his shoulders seem to be a nice purple color! can't see if Takeda is burned too, but i guess it woulnd't be a problem for a fireman...ok, bad joke, I know.